The weather has been beautiful lately. We've been doing a lot of yardwork, even though our neighbors probably can't tell yet. We just planted several new plants and we're trying to plan out the beds that still need attention (which is, well, all of them), but new plants keep popping up. Who knew we had so much pretty phlox? Or tulips? Or those wacky purple flowers that are blooming by the a/c unit? So I went outside this afternoon to take some pictures of the plant beds so we would know where everything is next time we want to plant something. On my way out the front door, I noticed (to my dismay) that it was unlocked and apparently had been since yesterday evening when Matt and I went outside. So I locked it. That's right. I locked it. Was I carrying my keys? No. Was the garage door open? NO. Was the back door unlocked? NO! 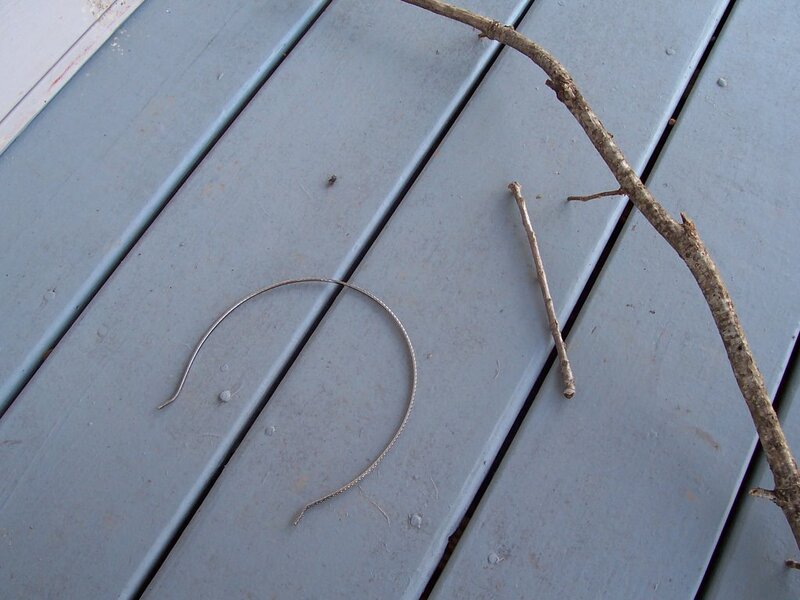 That's my headband, a big stick, and a little stick. In the end, my finger did the trick and I just had to climb in, and then replace the screen. And yes, I actually did get the pictures of the yard.